But its clearly one of those alien brain things, like Krang. It seems to be wearing a kind of transparent, powered wetsuit. Or maybe it's some kind of Matrix thing where someone discovered they were a brain in a jar and this is them making their escape? Or maybe it's the latest in message-in-a-bottle technology. Instead of a letter drifting aimlessly on the current this thing will actively swim to its target and then all you have to do is plug it in and you get an entire brain's worth of multimedia communication. 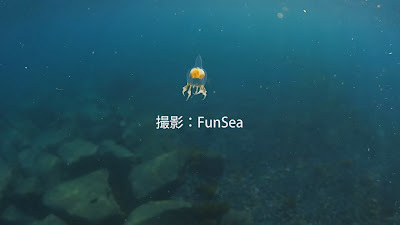 Definitely not a mere jellyfish, at any rate. Ha! I had to look that up. One of these days I should sit down and get through all those old Star Treks. I doubt I've even seen every episode!